This coronographic image shows the disk surrounding the star AB Aurigae, with the middle region shaded to block out light from the star. The depleted region of dust (inset) and the denser clumps (shown in the inset near the end of the white guide lines) seem to indicate the formation of a small body there, according to scientists. Astronomershave peered into the womb of a stellar disk to capture an image of materialfalling onto what could be a planet in an early stage of formation. 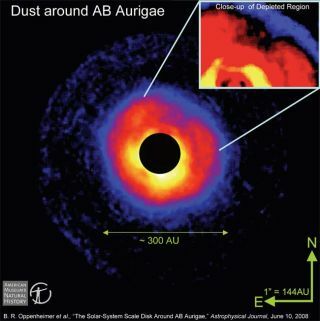 The newimage shows a somewhat horseshoe-shaped void in the disk surrounding ayoung star called AB Aurigae. Within the void, a barely visible bright spotcould indicate a developing object that's currently between 5 and 37 times themass of Jupiter. "Thedeficit of material could be due to a planet forming and sucking material ontoit, coalescing into a small point in the image and clearing material in theimmediate surroundings," said researcher Ben Oppenheimer, anastrophysicist at the American Museum of Natural History in New York. "Itseems to be indicative of the formation of a small body, either a planet or abrown dwarf." A browndwarf is considered a star that's notmassive enough to generate the thermonuclear fusion that powers real stars. To date, noconfirmed extrasolarplanet has been imaged or seen directly, as no one yet has succeeded in effectively blocking the light from the parent star that overwhelms the faint glow of anearby planet. If thisobject is a planet, the image does not show the planet itself. Oppenheimer saidthe image shows what's thought to be dust accreting onto the object. "Themain problem is that the stars are hundreds of millions to billions of timesbrighter than the planets that orbit them," Oppenheimer told SPACE.com. "So the glare of the star wipes out any hope of really seeing theplanets." Planet-formation theorist Alan Boss of the Carnegie Institution of Washington called the finding "an intriguing situation." He added: "And given that it's a fairly massivedisk with big spiral features, there's a good chance that something is formingin it." Based on the apparent intensity of the object along with itsdistance from the primary star (about 100 times the distance from Earth to thesun), Boss speculates the object is more likely a brown dwarf. Oppenheimerand his colleagues blocked out most of the stellar glare by attaching acoronagraph they had developed to a U.S. Air Force telescope on Maui, Hawaii. They also used polarization filters, which show light scattered off the disk. Theobservations, set to be detailed in the June issue of the AstrophysicalJournal, could fill a gap in astronomers' understanding of planetformation, which they are pretty confident occurs within the disks of materialsurrounding young stars. While the exact ways in which gas giant planetsand brown dwarfs form are not known, it's possible both objects develop in thesame manner in the material that swirls around a newborn star. Boss callsthe finding a "great step forward toward trying to understand how planetsform and being able to image planets in formation as well as matureplanets." The star ABAurigae is quite young, estimated to be between 1 million and 3 million yearsold. Our sun, by comparison, is 4.6 billion years old, but most of the planetformation in oursolar system is thought to have taken place in the first hundred millionyears or so. Pastobservations of stars slightly older than AB Aurigae indicate that at somepoint during planetformation, gas is removed from the dusty disk surrounding the stars. Howthe gas exits has remained a mystery. The situation at AB Aurigae couldrepresent an intermediate stage in which some mechanism is clearing out the gasfrom the disk's center and leaving behind mainly dust. "Theimage produced speaks directly to the biggest, unresolved question of planetformation ? how the thick disk of debris and gas evolves into a thin, dustyregion with planets," said National Science Foundation Program ManagerJulian Christou. Theresearch was funded in part by the NSF, U.S. Air Force, NASA?s TerrestrialPlanet Finder Program and individual donors.